Earlier this year, amateur pilot Janet Rafner, told us why science matters to her. Now, she has taken her interest in aviation and fluid dynamics to a new level by combining her skills in art and science to lead a new computer game effort that explores turbulent flow. Play games and help solve complex physics problems? That’s right -- You can play the game here and help Janet and her team get one step closer to understanding turbulence, which was described by renowned physicist Richard Feynman as “the most important unsolved problem of classical physics.” Unlocking the theoretical basis of turbulent flow is one of the seven Millennial Problems in physics. The Richmond native is no stranger to physics outreach and public engagement. While an undergraduate at the University of Virginia, she was a National Physics Day presenter and curated an exhibit at the Science Museum of Virginia titled “Call me Quantum.” And last year we featured Rafner in our Hot Shots and Hot Jobs for her Fulbright Fellowship work in scientific visualization. Four years ago, Rafner who is the driving force behind the Turbulence game, took a course at the University of Virginia entitled ‘Turbulence in Art and Math’ and it changed the way she saw the equations. The course was taught by Prof. Zoran Grujic, who has been instrumental in researching the math behind the Turbulence game. “In designing this game, I wanted to highlight the connections between art and science. Many famous artists have been inspired by the phenomena of turbulence from Van Gogh in Starry Night to Hiroshige in The Wave. When someone plays ‘Turbulence’ I want the game to convey a sense of serenity -- this is a very relaxing experience; you get to explore and improve your skill but it’s not a race. And you can do real science without being in a lab; it’s very easy. In the Turbulence game, players compete against each other to explore the complex 3D shapes that are formed in chaotic regions of turbulent flow. In technical terms, we call these shapes RIVs (the Regions of Intense Vorticity). We can see RIVs, but we do not know much about them. That is where ScienceAtHome is seeking the help of citizen scientists to engage in finding the `biggest’ RIVs in snapshots of the computational simulations of several typical turbulent flows; in this context, the biggest means the one that will hold the largest sphere. The data collected from gameplay will be analyzed to gain a key geometric insight into the phenomenon of `turbulent dissipation’. The gameplay will then help us get one step closer to understanding turbulence. The Turbulence game is an interdisciplinary collaboration between the University of Virginia’s department chair of Mathematics, Professor Zoran Grujic, The Bio Complexity research group at Niels Bohr Institute and Aarhus University’s ScienceAtHome. Games produced by ScienceAtHome have now been played over 8 million times by more than 200k players across the world. 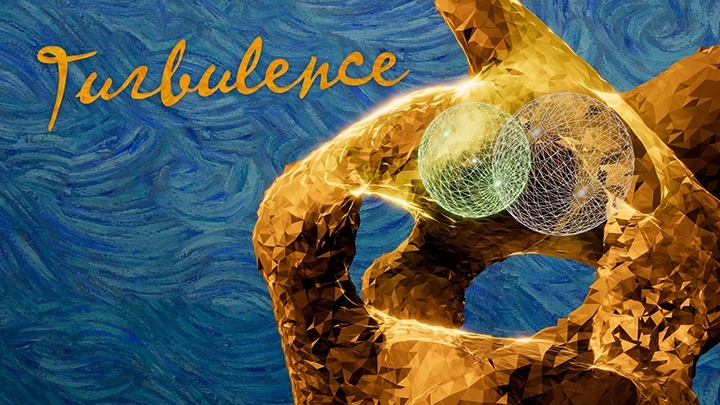 Now is your chance to contribute: play Turbulence here.